My aesthetics sense is usually that form follows function. I don't like bling, and I'm often puzzled that you have to pay extra to get some things plain instead of with extra plastic wood grain attached. 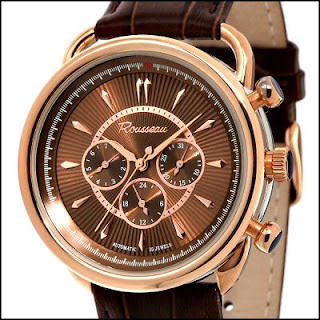 I like mechanical watches with a sub-seconds hand. 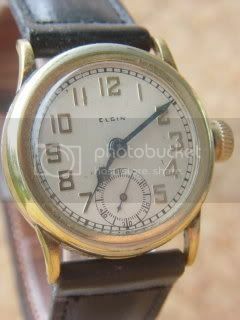 This is a 1908 Elgin that probably started life as a woman's pocket watch--I think the case is a late 20's or 30's style. The seconds hand has its own sub-dial at 6. Most mechanical watch movements (and clocks as well) have a gear that naturally rotates once per minute. Subsidiary seconds merely attach a hand to this gear. This was adequate on full-sized pocket watches, but when shrunk to wristwatch proportions they were quite small and relatively hard to read. There are some quartz watches with sub seconds, and for some reason they bother me--It feels like an affectation, adapting an inferior display for aesthetics rather than simplicity. Unlike a mechanical, the sub-seconds on a quartz is an add on device. 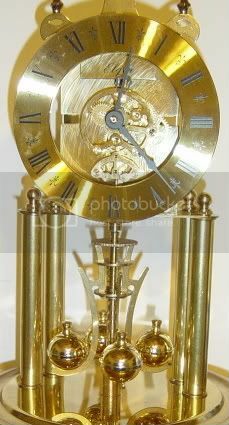 Some of my favorite clocks are anniversary clocks (also known as 400-day)--Mechanical clocks with a rotating pendulum that were wound once per year. and the movement of the pendulum is usually a poor imitation. Again, added complexity for no good reason. then it begins to bother me. This car also sports a nice faux radiator shell, to go with its eye-searing paint scheme. The 70's Lincoln Marks were great at having just about every tacky feature possible. In more recent times, Lincolns and Cadillacs have the faux-convertible look, but with framed doors, necessitating seams in the vinyl. This one was parked across the street from my house. It also has a sunroof in the middle of the "convertable" top. Even worse (and I wasn't able to find a picture) is when they put a sunroof in a faux convertible, and/or make the chrome gold. When my brother was young, he once asked me what vinyl roofs were for. I told him it was to make cars look better. He paused for a minute, and then said "No, really...What are they for? " And of course no post on automotive style atrocities is complete without at least mentioning the the plastic Woodie station wagon. 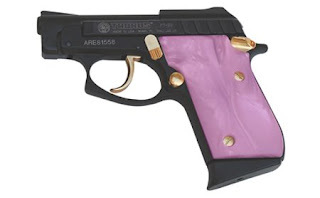 Taurus makes some hideous models of otherwise decent guns, like this black, pink and gold version of a Beretta Tomcat. They sell many of their models with gold accents. Ugly guns aren't complete without a gold, striped Desert Eagle. This isn't custom, it is a factory option. 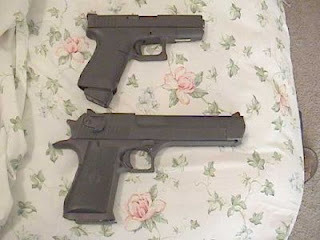 Not only is this gun hideously ugly, is huge--Shown below is a comparison with a Glock 17. Interesting about the seconds dial - I didn't realise that that was why they were used. ditto on the form/function thing, sevesteen...i linked back here from an "older is better" post of mine, if that's okay. 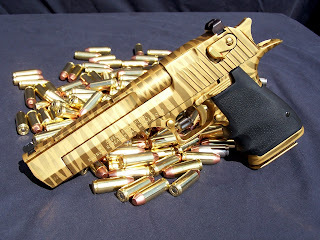 I don't agree that the gold, striped Desert Eagle is ugly, I think it's logical and beautiful. In mechanical terms and with a view to offensive action, the Desert Eagle is an inefficient pistol. It's too big for people with smaller hands, and for civilian concealed carry, and for military purposes. If you could carry a Desert Eagle on a mission, you could carry a submachinegun instead, and it would probably be more reliable as well as more effective, and less likely to bounce brass off your glasses. Desert Eagles are chosen, rightly, reasonably, for display and cultural reasons. They are imposing pieces of sculpture, with the valuable secondary function of firing bullets. People often buy pistols to imitate a model. If they do so with a Desert Eagle, the model is likely to be a movie or a television show. (The alternative might be an admired friend.) They will not be buying them to be like the employees of any real world military or police force, since such forces never issue them. If you have a finish for a Desert Eagle that reinforces its priority on "show" over "go" from the design up more consistently, by all means present it. I'm not convinced of the superiority of "traditional" gun colors, especially black, anyway. For a lot of people, "a handgun that I can easily find, even if I've dropped it in the dark, and that anyone I point it at will definitely see and hopefully be dissuaded by" is more to the point than "a handgun that can't be seen against the background of my ninja suit or SAS outfit, assuming I was in the habit of wearing ninja suits and SAS outfits and shooting at people I had not first shown clearly that I was armed." If you are saying that the tiger-striped Desert Eagle is an instant collectible, then I agree. I'm not a fan of stuff manufactured specifically to be collectible either. I really don't care much about the color of a gun, but given an option I'll stay traditional. If I have to use one defensively, I don't want color to either make my attacker doubt it is really a gun, or make a potential jury think I'm more of a gun nut than I am. That gun is not hideously ugly.